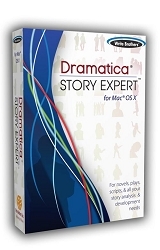 Ten years in development since the release of Dramatica Pro 4 comes the next generation of story structuring and story development software: Dramatica Story Expert! Built around the same patented Story Engine, Dramatica Story Expert is bursting with new tools and features that will once again revolutionize the process of story creation for novelists, screenwriters and playwrights. The new MASTER Story Engine cross references the dramatic impact of ALL your structural choices for your story, automatically finding holes and inconsistencies and even suggesting how to fill and fix them! The all new GIST system turns structural concepts into the subject matter of your unique story, enabling you to answer questions about the subject matter and receive back a map of the underlying dramatic structure! The Theme Browser graphically represents how all your story points relate in the complex web of your story and enables you to make dramatic choices simply by selecting your story's topics and how you want your audience to see them. The Plot Progression feature translates the dramatic tensions you have chosen into the sequence of events that will be required to create that tension. Or, choose the sequence of events and Dramatica Story Expert will tell you what kind of dramatic tension it will create! The Character Creation tool enables you to build either archetypes or to dive deep into your characters' personality to construct complex characters, all by simply clicking and dragging character icons to assign traits to them. The enhanced StoryGuide will lead you step-by-step through the entire story development process at a variety of levels through essential templates for novels, screenplays, etc. New "Project Overview" feature shows all key aspects of your story on a single screen. New "Getting Started" window provides access to templates, tutorials, and video guides to help you begin and complete your projects.